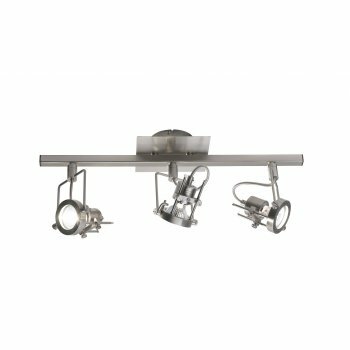 Dar Lighting Bauhaus halogen spotlight fitting 3 light ceiling fitting features a rectangular design ceiling plate with 3 adjustable lamp heads attached to a ceiling bar all in a satin chrome finish. The product code for this Dar ceiling fitting is BAU7346. With adjustable super tech lamp heads, the Bauhaus is both stylish and practical, allowing you to direct light where required, making this a perfect choice for mdoern decors. There is a 4 light ceiling fitting and a single light wall fitting also available in this range.